I love New Year's Eve at my parents. 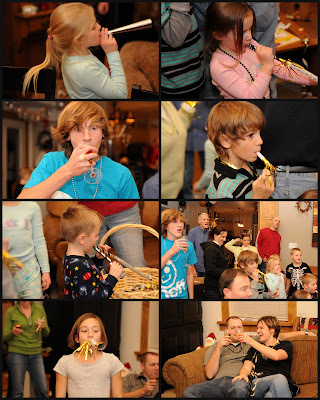 The food is always wonderful and the games are always enjoyable. I love watching my family enjoy one another. There was no tension this season, no eye rolling, no grumpiness and no moral debates. I think it is because we all decided to just have fun and play games. For us, I think the biggest difference was that we just resolved to be okay with the girls being out WAY past their bedtimes. Typically, around 8:00 we are rushing to get on the road so that the girls can have their bedtime routine. Doing this means there is stress to make sure everything gets done quickly and smoothly. Plus there is the tension when the girls are whining about not wanting to go home yet so Scott and I both get cranky. Which, of course, makes everyone else cranky. But this season we stayed late and the kids were exhausted and we paid for it every day, but it was worth it. The morning of the Nutty Nutcracker, Jade came into our room and said that she was just too tired and that we were doing too many things at night. She asked if we could spend a night at home going to bed early. 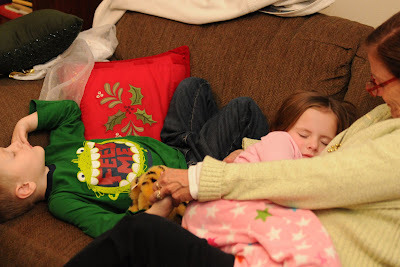 When she found out that we had the Nutcracker that night and New Year's Eve the next day, she asked if she could take a nap before the ballet. Sweet girl. Tired girl. The evening was enjoyed by our family, my parents' neighbors- Gary and Jeanette, their youngest and his wife, the McBride family and briefly my aunt and uncle. 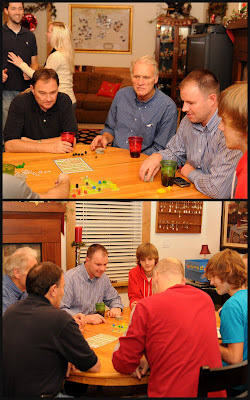 It was a full party with great games and conversation. I'm sure you recognize the game from previous posts. 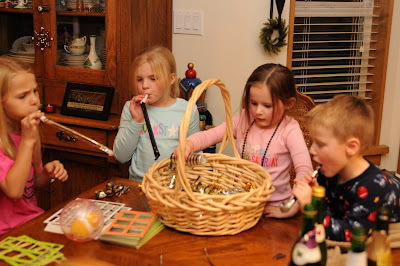 The kids were excited to get their noise makers and their bubbly. 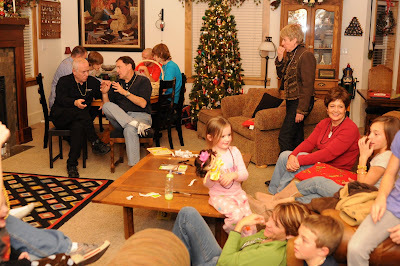 The adults prepared for the new year by turning on the TV to watch the ball drop. 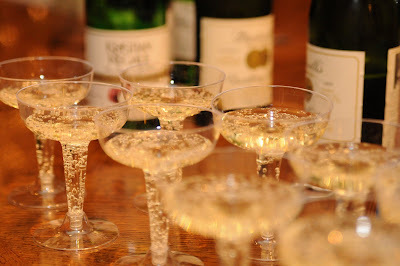 Dad poured the glasses of bubbly. Finally, around 3 in the morning, the two youngest were done celebrating. Mom and I joined them and crashed until the games were over- around 4:30. Jade and Asher were pretending to be asleep but didn't score a sleep over. It was a great night (especially since I finished with my end of quarter phone calls just after 7:00 PM- which isn't always the case).